MANILA - Three church bells seized as war trophies by the United States from the Philippines following one of the worst routing of American soldiers more than a century ago arrived in Manila on Tuesday (Dec 11), bringing to a close a contentious chapter in the two allies' shared history. 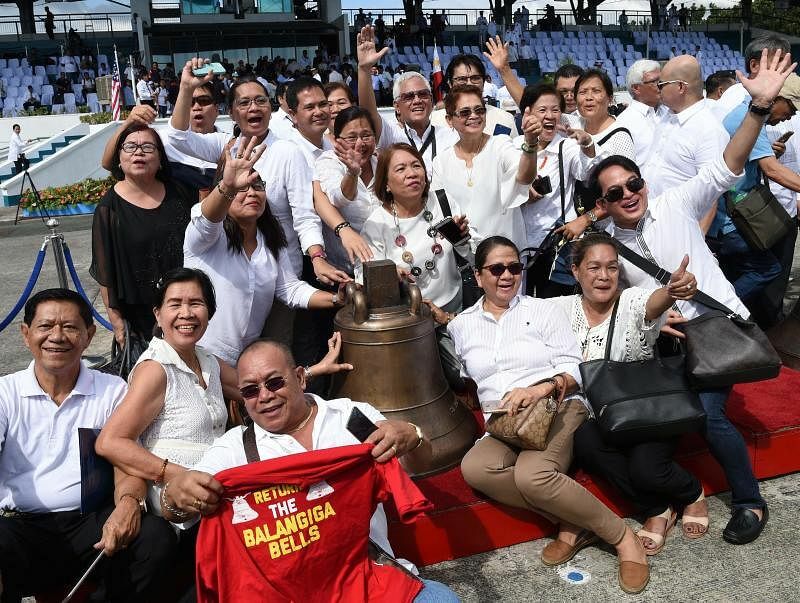 A statement issued on Monday by the Philippine defence ministry said the bells' return after 117 years "will catalyse historical healing for both the Philippines and the US". It will also "serve as a closure for both countries of a painful chapter in the past that was a grim consequence of war", the ministry added. The bells were taken after 48 US soldiers were killed during a surprise attack on Sept 28, 1901 in Balangiga town, in the central island province of Samar, during the Philippine-American war from 1899 to 1902. As recorded by historians, hundreds of men from Balangiga, some dressed as women to conceal the attack, hacked over 70 men of the 9th US infantry regiment who were having breakfast or reading their mails inside their camp. It was the worst defeat for US forces since the Battle of Little Bighorn in 1876, also known as Custer's Last Stand. According to historians, one or more of the church bells were rung to signal the attack. US forces took the bells after a brutal counterattack that killed 2,000 to 10,000 Filipinos, mostly non-combatants. Brigadier-General Jacob Smith, tasked to retaliate, was quoted by historians as ordering his men: "I want no prisoners. I wish you to kill and burn. The more you kill and burn, the better it will please me. The interior of Samar must be made a howling wilderness." Whole villages were systematically burned, crops were destroyed, and farm animals were slaughtered. Two of the three bells were later shipped to the F.E. Warren Air Force Base in Wyoming. The third bell was placed at a US Army museum in South Korea. All three bells will be on display at Villamor Air Base, headquarters of the Philippine Air Force, until Saturday (Dec 15), when they will be airlifted to Balangiga and installed temporarily at a public park. Mr Duterte will fly to Balangiga to formally turn the bells over to the town's parish priest, Father Serafin Tybaco. He was supposed to witness Tuesday's handover rites, but opted out at the last minute. Plans are currently being drawn to either reinstall the bells at the belfry of the church where it was taken, or house it inside a museum. Replicas of two bells will be installed in Wyoming, according to US Embassy in Manila spokesman Molly Koscina. "It is never easy to give up something you see as a memorial for those who did pass away," she said. Some US veterans and Wyoming's delegation to the US Congress had opposed returning the bells that had been a memorial to the 48 US soldiers killed in Balangiga. The Philippines had been asking for the return of the bells since 1958. Former president Fidel Ramos, a West Point alumnus, raised the issue with his counterpart Bill Clinton. But negotiations stalled over what was then seen as conflicts with US military laws. Mr Duterte again asked the US to return the bells last year, calling them "reminders of the gallantry and heroism of our forebears who resisted the American colonisers and sacrificed their lives in the process". His supporters had been quick to chalk up the bells' return as a mark of US acquiescence to Mr Duterte's foreign policy. Since he took office in 2016, Mr Duterte has pivoted away from the US, the Philippines' long-time ally, as he courted investments from Beijing to push Philippine growth through an ambitious, US$169-billion infrastructure-building programme. But Ms Koscina said "it was not due to any particular event or statement". "There are number of presidents, a number of secretaries (of defence), a number of US and Philippine ambassadors who worked for the return of the Balangiga bells. It was decades worth of work and protest from the veterans, and the legal issues that came with it," she said. "People have worked for this for many, many years," she added. "It is time (to return the bells), and we are very proud that it is happening."